← Meteora beauty: Meditating on the awe of creation and life. 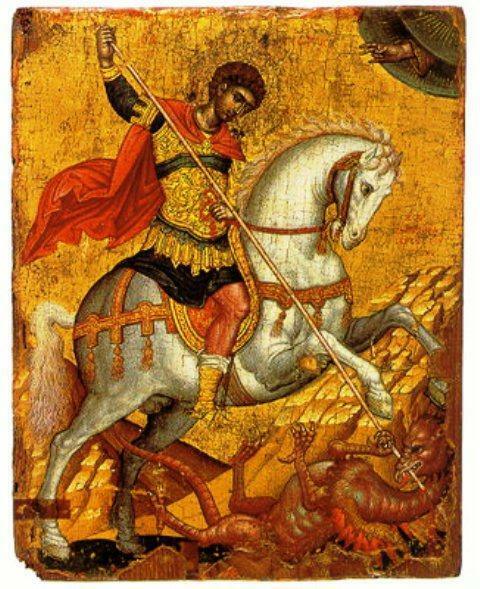 Saint George was a Greek who became an officer in the Roman army. His father was the Greek Gerondios from Cappadocia Asia Minor and his mother was the Greek Polychronia from the city Lyda. Lyda was a Greek city from the times of the conquest of Alexander the Great (333 BC), now in Israel. He became an officer in the Roman army in the Guard of Diocletian. He is venerated as a Christian martyr. In hagiography, Saint George is one of the most venerated saints in the Catholic (Western and Eastern Rites), Anglican, Eastern Orthodox, and the Oriental Orthodox churches. He is immortalized in the tale of Saint George and the Dragon and is one of the Fourteen Holy Helpers. His memorial is celebrated on 23 April, and he is regarded as one of the most prominent military saints. There are many different customs around Greece honoring Saint George’s memory, but only one that we know of to involve colorful headscafs, climbing and dancing on the cliffs very edge all at the same time. 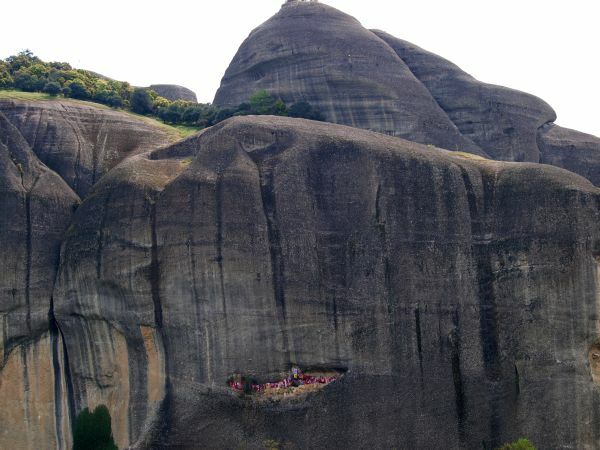 It takes place on an old ruined monastery dedicated to Saint that was build inside a cave some 40 meters above ground on the north side of a Meteora rock. There is an old story circulating from mouth to mouth mainly in Kastraki village about the origins of the custom. In the early 17th century Meteora area like the rest of the Thessaly and most of Greece was under the Ottoman rule. A Muslim landowner and his wife were cutting down some trees next to Saint George’s hermitage. While the Muslim man was chopping down the woods he had an awful accident. The tree he was cutting down fell over him and as a consequence he was badly wounded. His wife immediately upon realizing her husband’s accident she rushed to help him, but she couldn’t do much. The man lay there on the ground with his wife crying over him when people from the nearby village of Kastraki heard the hopeless screams for help of the injured man’s wife, and so they rushed there to check out what exactly has happened. Upon seeing the seriously wounded man on the ground they immediately realized that the Muslim man had slim chances to win the day. So all they could do was to advice his wife to turn to Saint George and prey on him for help. Having nowhere else to turn, she decided to follow the advice of her Christian neighbors and so she made an offer to the Saint to spare his life. She offered St George the only valuable she had, her colorful headscarf. And behold the miracle! After the passing of only few days the man clearly was getting better. And at the end not only did he manage to survive but as the story goes he was able to walk up straight again, becoming completely healed. So significant was in the minds of the locals the above event and the associated miracle, that in memory of all this once every year after the church service on the name day of the Saint every 23rd of April, young boys and girls climb up with ropes to offer colorful headscarves to honor Saint George miracle. They are doing so believing that “Saint George the Mandilas” will help them to maintain good health throughout the year and of course to have fortunate marriages. 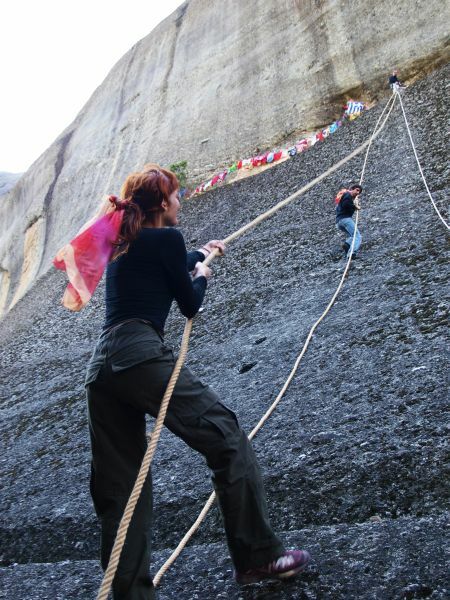 Fact is that as far as we know and despite boys and girls climb up there every year without using any safety gear but ropes, none fatal or any other sort of serious accident ever happend during this custom celebration. All locals here in Meteora are deeply convinced that the Saint is always present protecting all the ‘Mandilarades” from getting injured. “Mandilarades” in Greek are named all those who climb up each year to change the headscarfs, called “mandiles” in greek language. The place where one can find the old ruined monastery of St George of Mandilas is very near to Kastraki central square and easy to reach it even from Kalmpaka, with lots of amazing hikes and trails starting from that same area. But if you wish to find all the hidden gem and learn more of the place history like the story above, then we strongly advice you to take the “Holy Spirit” Hiking Tour. This entry was posted in Monastic history, St George the Mandilas and tagged customs, meteora history, meteora story, meteora tradition, monastery, St George the mandilas. Bookmark the permalink.